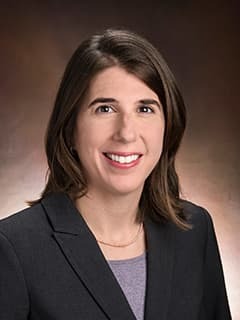 Heather A. McClung Pasqualino, MD, is an anesthesiologist and Associate Medical Director of the Radiology Anesthesia Sedation Services at Children's Hospital of Philadelphia. McClung HA, Schwartz R. Anesthetic Management of Tracheoesophogeal Fistula repair in a newborn with Double Outlet Right Ventricle. Journal of Clinical Anesthesia 2011 Dec: 23 (8): 643-645. Kraemer FW, Stricker PA, Gurnaney HG, McClung HA. Bradycardia during Induction of Anesthesia with Sevoflurane in Children with Down Syndrome. Anesthesia and Analgesia 2010 Nov: 111 (5): 1259-63. McClung HA, Schwartz R. Anesthetic Management of a Patient with Surgically Corrected D-Transposition of the Great Arteries Undergoing Laparoscopic Pyloromyotomy. The Internet Journal of Anesthesiology. 2010 Jan;104(1):12-5. Rieman DJ, McClung HA, Dodds RA, Hwang SM, Holmes MW, James IE, Drake FH, Gowen M. Biosynthesis and processing of cathepsin K in cultured human osteoclasts. Bone. 2001 Mar; 28 (3): 282-9. McClung HA: Neurologic Diseases (Chapter 8) in Fleisher, L. (Ed.) Anesthesia and Uncommon Diseases, Saunders, Philadelphia, 2006, pp. 275-276.